Thunderbird Online offers three main funding options that you can utilize to complete your registration for your Thunderbird Online program. You can pay for your Thunderbird Online program using your personal or company credit card using our secure online registration process. If your company is sponsoring your Thunderbird Online professional development program, you can request an offline invoice for your company to pay upon receipt. If you already have your funding letter of approval (voucher), please upload that upon registration to expedite your registration process. After successfully completing a term of service, AmeriCorps members who were signed up for an education award are eligible to receive a Segal AmeriCorps Education Award. Find the best program to meet your professional development goals. The Military Spouse Career Advancement Accounts (MyCAA) program provides up to $4,000 (over 2 years) of Financial Assistance for military spouses who are pursuing degree programs, licenses or credentials leading to employment in portable career fields. Learn More. 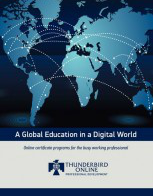 Thunderbird Online’s Executive Certificate in Global CSR is an approved program for funding from the Arizona government for individuals residing in the state of Arizona to better their career opportunities. Have questions on Thunderbird Online's payment options? Contact your Thunderbird Online Enrollment Counselor today.